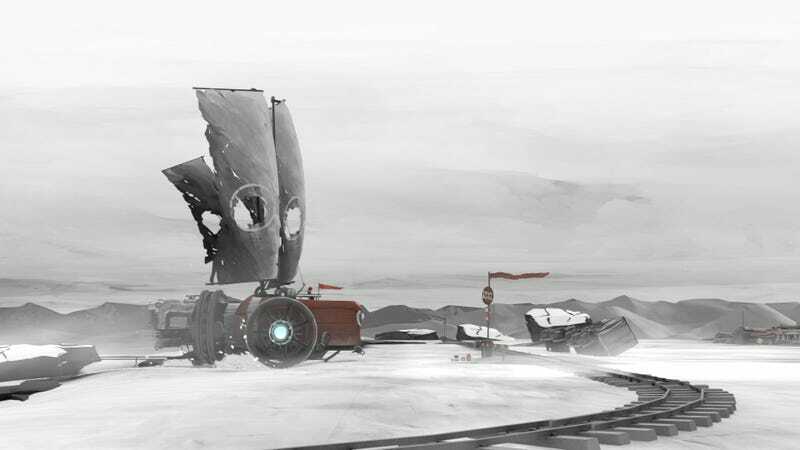 In the universe of FAR: Lone Sails, the world is ending. The seabed has dried up, most people are gone, and you’re left to wander the wastes alone in a rickety old ship that’s constantly running out of fuel and breaking down. As depressing as all that sounds, though, the game is actually a nice little trip. FAR is a side-scroller where all you do is move around your ship keeping it running so that you can explore the world around you. Sometimes you have to hop out to make repairs, activate switches or collect fuel, but most of the time you’re just bouncing around the inside of the very homely vessel, flicking the switches and operating the levers necessary for the ship to stutter along from left to right. It’s simple, repetitive, maybe it even sounds a bit boring, but there’s a lovely rhythm to it once you master everything that’s almost relaxing. Pump the fuel, crank the bellow, watch a dead world drift by out the window, it’s all very zen. The reason your actions in the foreground are so mundane is that they’re the excuse to unfurl the real star of the game—the dying world—in the background. Every few minutes of movement in FAR brings you an obstacle to overcome, but also a change in scenery as the terrain and weather shift around you. Initially the solitude and mystery feels a bit like Inside, as though this is going to be a suffocating tale of dread and woe, but you soon realise that, nah, FAR isn’t about that. This is just a trip, where your only encounters are with the wind and rain, not zombies or monsters, and the further you go the more opportunities you get to learn about what’s gone wrong in this dead but beautiful world. FAR’s out now on PC.